We all know those great financial reasons to live in a small house: less mortgage, less maintenance costs, less heating cost, and so on. It is simple, if you can’t afford big then go small. But what if you WANT to live small? Does that make any sense? I think it does. 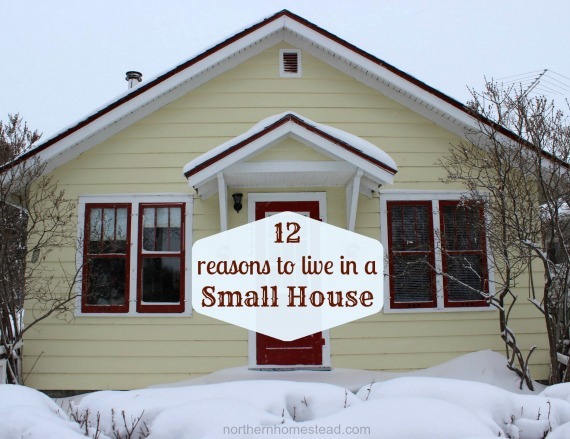 Here are 12 reasons to live in a small house – other than money. I love cozy rooms. There is just something about them, isn’t it? Just try to make a 1000 square foot living room cozy. Hmm, sure there are ways, but it wont be the same as a small place next to a wood burning fireplace. We are in Alberta and yep, it is cold here. To heat up a small house to a warm temperature is not hard. In fact, that is the main reason why people in the past had small houses with low roofs and tiny windows. Thankfully today we have better solutions for heating, but still, small is warmer, and I like it warm. Deco items are dust collectors and so many of them are questionable (Still just deco or an idol???). The bigger the house, the more you decorate, and the more dust it collects. On the other hand just some green plants and /or flowers in a small room make it look decorated. Truth is that a person makes just as much mess in a small house as they would in a big one. So if there are more people in a small house, cleaning needs to be done more often. But it takes less time. Plus, there is no empty space to be cleaned. Small houses do not have places to escape each other, everyone is everywhere all the time. Music and conversations are shared. We are more aware of each other and spend more time together. If you are looking for some really unique storage solutions, look for small places, they have them. IKEA is a great example with those tiny apartment showcases. Small spaces are inspiring. Sure there are people who clutter even their sleeping place, but generally speaking the more space you have, the more things you gather. Small spaces help to stay on top of things and not gather unwanted stuff. There are no dark and empty spaces, no unattended doors and windows. A small house gives you the feeling of being in control of every corner, to feel secure. Less clutter – less cleaning – less shopping; it all helps to live simpler, in the moment, with time left for more important things. The more we own, the more it owns us. To have less things to care for frees you emotionally, too. People in a western world generally spend too much time indoors. A smaller space forces you to get out and enjoy the great outdoors. Bigger is not always better! You might be happier in a smaller house, I sure am. Any “The Smaller, The Better” reasons I missed? We invite you to subscribe to NorthernHomestead and follow us on Facebook or Pinterest for more great tips. I can understand that. We lived for a while in a 4 level split. Way to much space. I always wanted to downsize, so thankful we could! These are some fantastic reasons! Love this post!!! Thank you Kirsten. There are reasons for going bigger sometimes, but I find more good reasons to live in a small house ;). I live in a small 960 sq ft house and I could not agree more! I would add that if you have a small house, you don’t have to worry about house guests that overstay their welcome. LOL! That is a good one ;). Great post! I grew up in a 700 sq ft house (with lots of people in it over the years!) and I agree that there are lots of good things about going small! Interesting, I think most of us (older folks) grew up in small houses. How did we get to like such big houses? Just wondering. Thank you for stopping by! Hi Andrea, thanks for stopping by. There are times in life when a bigger house makes sence, but you are right, a smaller house would give you more growing space ;). Don’t forget, with a small house you can afford to have much more architectural details. By the time you build your 3500 square foot house, all you get is lots of sheetrock. Smaller houses cost less to build, so you can add nice architectural details and not be killed by the final price. Architectural details are a good point. More quality then quantity. I love our small house…I used to want a big McMansion, but the older I get and the more cleaning I have to do, smaller is better!!! Yea, cleaning is a big one for me, too. We want to downsize a bit once we get our house sold and buy another one. Our’s is currently 2,000 sq.ft which I never considered to be large but now that we are empty nesters, it does seem too big sometimes. I really like all of your reason but #s 4 & 5 are quite appealing! All so very true. I love being cozy and living a simpler life. We have downsized 3 times in the past 7 years and it feels so free! We are renting an 1000sqft house on a small city lot and will be a family of nine when baby comes in May! Love living as simply as possible, but I still need to get rid of more “stuff”. Wish we had more land, but our house size is just fine for us! The only complaint we have is that the bathroom is not set up well for our disabled 7-year-old daughter for us to give her baths. What a great example of living in a small house and being happy! Hope you find a solution for your daughter. they’re a lot cheaper and quicker to build by yourself leaving you with less or no debt which then allows you to focus your energy to other things than simply bread labor. we have a 576sqft home we built ourselves out of primarily recycled materials. there will be 4 of us (the 4th is due in a few weeks) and houserabbits and we have more than enough space… if you’re worried about storage think vertical and think multipurpose! but we wouldnt ever build bigger even if we have more kids (except maybe a little 8×8 addition to house a woodburning stove so that its far enough away from toddlers)… its the perfect space for a family. you simply dont need more. and we dont have any debt. it is our home free and clear. Good for you Jennifer, thank you for stopping by! Ha ha… I never would have thought of it this way….We own a small home and it sure comes with all the reasons you mentioned. Although our kids are quickly outgrowing us:) Great post! aside from my home now my favorite home was when I lived in a 2 room apartment. I loved the nooks and crannies that i found to organize things. I even ran a business from there and printed 10,000 newsletters a month there! So the small place did inspire ideas and creativity ;). Thank you for stopping by, Tamara! Small is great – I thought when we purchased out 1400 sq foot house it might be a problem but it made me realize after the kids move on we could go even smaller. I’m planning my next home to be under 700 square feet and I can hardly wait. My hubby is even excited! There are different seasons in life where we need less or more. Thanks for stopping by, Carole! That is a great reason. Such a great list! I agree with this list, but I suffer from a problem! The house my husband and I live in is my childhood home, I’ve lived here pretty much my entire life. And this house is big! At least 2000 square feet. My problem is I’m so used to so much space…we’ve looked at other houses and I almost feel claustrophobic walking around! I’m hoping this gets better as time goes on! I can see your problem, it would be hard to give up a house that has been your home for so long. Our small house is also very easy to keep cool during the summer. We can open the windows at the front and back and the breeze just travels straight through. Also, when it gets to be too sweltering to do even than one small window a/c unit and a fan to push the air work wonders! We do have a large lot, so in the summer a lot of time is spent outdoors gardening and reclaiming our land since it was left to go wild for ~5 years! Oh, and no need to yell to get someone’s attention, speaking at a normal volume works just fine. Our family of four lives in a modest 1600 square foot home, and I do not want anything larger. We even have areas in this home that we don’t always use. Our favorite benefits: Low mortgage, lower upkeep costs, increased family time together (not too many place to escape each other – your #5 is perfect! ), affordable utility costs, and yes, it keeps the clutter and the headaches down because we just can’t own a lot of things. I was raised in a 3500 sq foot farmhouse, and I remember chores, so my personal fav? 1600 sq ft is waaayyyy easier to clean! Imagine going down to 1000sq ft and under. It can get cozy ;), but I love it. Hi there! I’m in Alberta too (30 mins outside of Edmonton). Thank you for posting this. Hubby and I own 2 houses. We rent out our small house in town and live in a 2400sq ft house. We are a family 6. We’ve recently decided that living in this house there’s tons of ‘dead’ space the children nor I use. We’ve decided to downsize, and when I mean downsize I mean DOWNSIZE! We’ve decided to sell our 2400sp ft home and moving to our rental house. Now I’ve gotta add, our rental is just over 1000sq ft, THAT’S IT! It’ll definitely be cozy, but our main reason to downsizing is because I’m sick and tired of hubby working out of town (Fort Mac). Smaller house means smaller mortgage, too! Thank you for listing all the other reasons, they make me feel undoubtedly like this is the right choice for my family! Welcome Sandra, I am always happy to see Albertans readers! We love our small house too. We are just below 1000sq ft. It sure is nice! I agree, better to live small, but be together. Thank you for posting these excellent reasons for going small. My husband and I are planning on doing the same thing very soon. We are self employed and looking at retirement and it just makes sense to go small. We would love to go about 750 sq ft. I think the important thing is to find the “right” plan. Hope you can find your right place soon. 750 sq ft sounds lovely for two people. Well, this post is about reasons other then money. You right, there are lots of financial reasons as well. I’ve lived in my 1000 sq. ft. Home for 13 yrs, and this article nails it. I love that my mortgage is only $355/ month and that my water/gas/electricity/internet utilities total $260/ month (not to mention home insurance is less expensive). I have money to pretty much go where I want and do what I want, I DON’T have to work full-time AND it’s easy to keep clean!